Above, you'll see the evolution of my personal decorating style. Things I'm planning on parting with. Things I'm keeping because they're a steady part of my style. 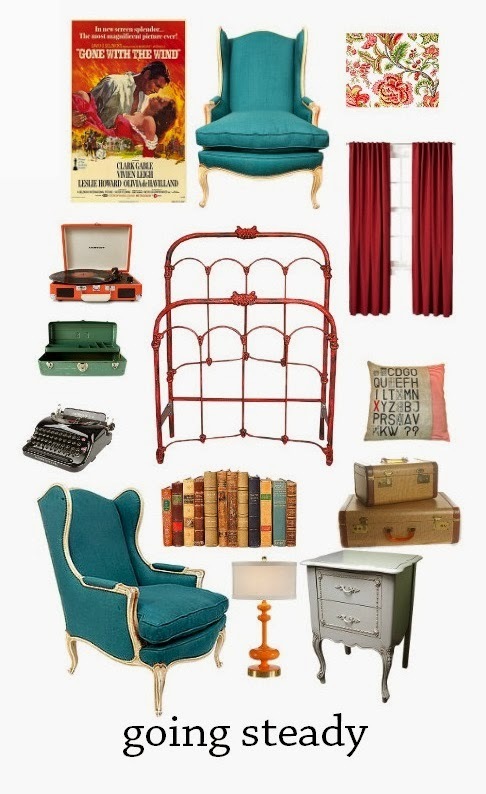 And things I want to integrate into my space. The time has come to swap out the old and bring in some new. For the last year or so, I've been itching to switch up my style. Well, actually... my decorating style has shifted. The shift requires more than changing out some pillows, bedding, and curtains. I love them. I'm just not in love with them. I find myself yearning for less frill and femininity. These pieces have been with me a good long time, but it's time to move on. And breaking up is hard to do – even with furniture. 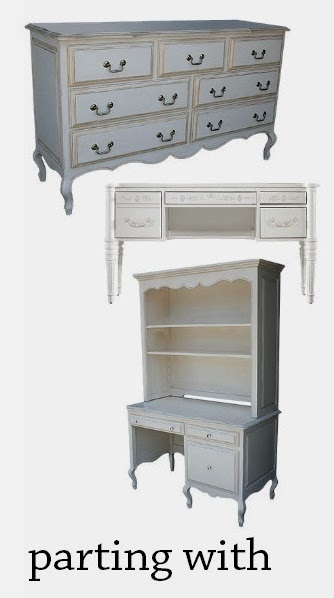 I took the plunge and put all of my French provincial pieces up for sale (a tall dresser, a dresser with a hutch, a tall and skinny lingerie chest, a vanity, and a writing desk). I'm keeping my French provincial nightstands because I simply can't part with them – and I still want a touch of that frilly, feminine, off-white French feel. A very nice couple came to look at my furniture last night. I felt like I wasn't just selling my furniture, but putting it up for adoption. Would these prospective parents give my vintage babies a good home? Would they give them a nice, fresh coat of paint? Or would they adore the charming character from a nick and scratch here and there? The couple just bought a Victorian house and have outfitted the place with only vintage and antique furniture – collecting the cream and gold French provincial pieces to furnish a room for their oft-visiting granddaughter. Maybe I shouldn't get so emotionally attached to furniture, but I do. The couple decided that they'll buy the vanity, the dresser with the hutch, and the writing desk. They eyed my nightstands, too, but I quickly professed that they were not for sale at this point in time. While I can part with the hutch and vanity, I seem to be having separation anxiety about parting with my writing desk. It's so lovely. A little small, lacking in storage and desktop space, but still so very charming. I've had it for five years – five years of writing novels, blog posts, love letters, etc. The thing is: I have a lot of stuff. My stuff and my style haven't changed for years. My taste has changed, but I haven't gotten rid of old items to make room for new. The French provincial pieces just don't fit the aesthetic I'm going for now. They're too matchy matchy. I want to get more eclectic. 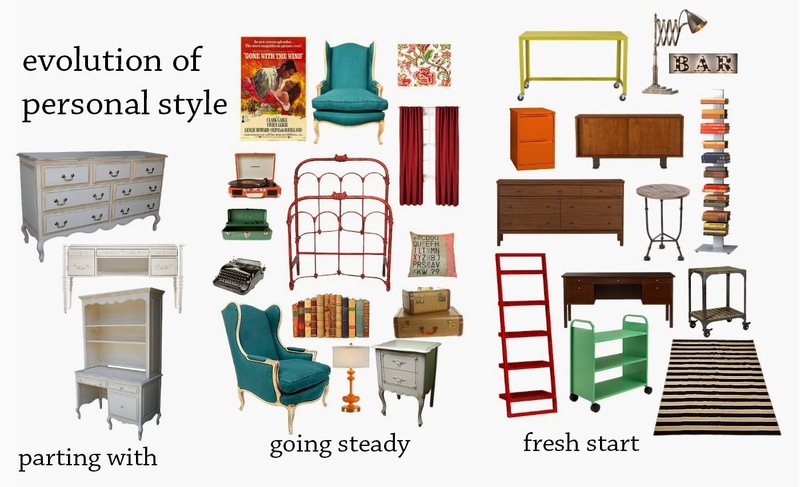 Since I still have furniture with a lot of curves (my antique turquoise chairs, my French provincial nightstands, my red wrought iron headboard) I want to throw something new into the mix. Pictured above are examples of furnishings and accessories that will continue to be a part of my place. Out with the curvy French provincial vanity-turned-tv stand – in with a sleek console from the sixties or an industrial style side table. Out with the shabby chic dresser hutch – in with a rolling bookcase or ladder shelf or (even better) an Ikea Expedit shelving unit. 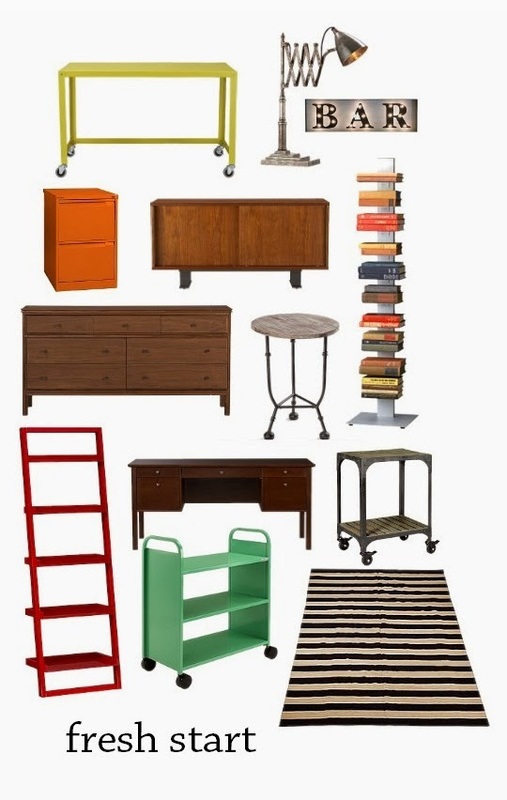 Out with the frilly, feminine dresser and lingerie chest – in with the clean lines and rich wood tones of a long, handsome mid-century modern dresser. Out with the small, charming writing desk – in with a big farmhouse table or industrial desk that I can spread out my writing and work on. I want to throw industrial and rustic in to contrast with the antique and feminine. I want to contrast some strips with my florals. And most of all, I want my space to be even more eclectic – a hodgepodge of color, pattern, texture, tones, eras, and styles. I'm so excited to really revamp my style. But really... I'll be sorry to see that writing desk go. Have you ever experienced separation anxiety when parting with furniture? Am I in good company or am I just being melodramatic?